Sending money isn’t as easy as sending an email, especially when it’s dealing with foreign banks — at least not yet. Two U.S. banks, New Jersey-based Cross River Bank and Kansas-based CBW Bank, are set to announce their use of the Ripple currency protocol, which would allow instant and free cross-border payments on the network. The Ripple Transaction Protocol (RTXP) is an internet protocol like HTTP or SMTP (which is what powers email) that allows a transfer of value across a distributed network. No one “owns” the World Wide Web or e-mail, and likewise, Ripple is an open-sourced protocol with no owner or operator. Because email is based on the SMTP protocol, you can send messages freely regardless of where a person is located or what’s on the end of the URL (like Gmail.com or AOL.com). Money, however, doesn’t quite flow that freely. While the internet exploded thanks to the HTTP protocol, global payment networks sprung up as walled gardens. 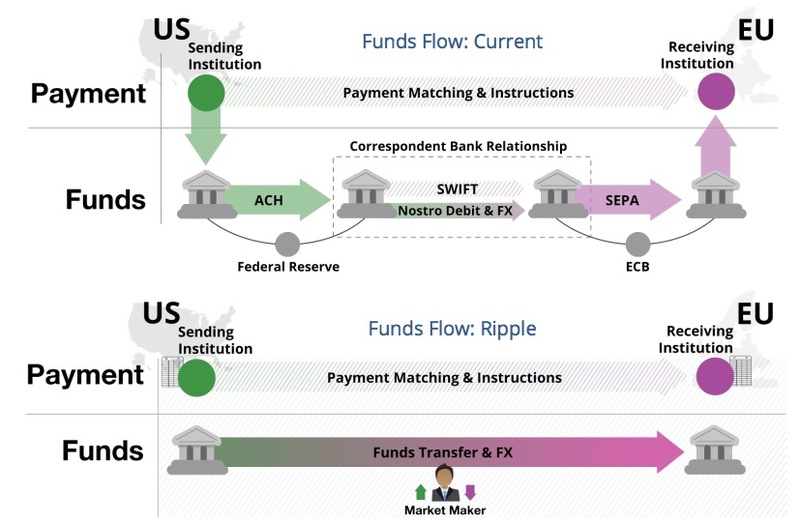 A comparison of sending funds internationally using Ripple versus existing systems. Courtesy of Ripple. Ramamurthi said one of his bank’s main strategies is international remittances, so he hopes the protocol will help accelerate growth and connect him to banks worldwide. “At the end of the day, as the world gets smaller and the velocity of transactions increase, people want to send money instantly,” Ramamurthi said. However, it’s not quite as easy as a bank flipping a switch to enable Ripple. The U.S. has strict know-your-customer (KYC) policies and many layers of compliance and regulation, especially when it comes to overseas payments. No one wants instant payments to terrorists, so Ramamurthi’s affiliate tech company, Yantra Financial Technologies, has had to build new international compliance software that could stop or flag a transaction in fractions of a second. Gilles Gade, president and CEO of Cross River Bank, saw the compliance issue as an interesting challenge to tackle, rather than a hindrance in adoption. His company will be developing their own set of “very stringent” compliance guidelines that should be ready in the first quarter of 2015. The bank is a transactions bank, so it is adding Ripple as another option for clients rather than replacing its whole system. Gade was drawn to Ripple for two reasons: the fact that it’s currency agnostic (you can trade between Euros and dollars without touching cryptocurrencies) and that the agents on either end of the transaction are licensed banks. Despite the promise of instant payments internationally, the Ripple protocol will take a bit of bank persuasion and education before it takes off, but having FDIC-licensed banks in U.S. is a start. Both banks join Germany’s Fidor Bank, which came onto Ripple in May, as the pioneering agents on the network.